The region’s excellent solar resource, role as a major regional hub, supportive regional council and community, and favourable attributes make it an excellent locality for a solar energy facility. The community has demonstrated continued and consistent support for this project that will develop a local skill base and create employment. 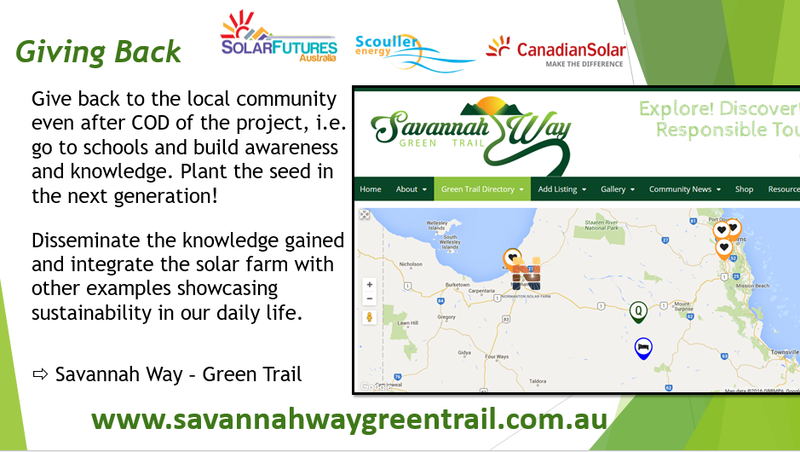 The Normanton Solar Farm aims to provide clear, open and honest communication with stakeholders. The following key topics will be addressed through regular updates , with the detail of those messages tailored to meet the needs of audience groups such as communities and other stakeholders. Community benefits and opportunities – short, medium and long term. The Normanton Solar Farm approach to communications will be to provide two-way communication wherever possible with all stakeholders in order to encourage stakeholder input. We are extremely grateful for the support the community has demonstrated for this project so far. Training and development opportunities availability for Savannah Guides in conjunction with future planned tourism programs. Note that there will be no tourism activities on site, as the focus is only on education, research, and knowledge sharing. Tourism display will be located at the Normanton Visitor Information Centre. Direct access to knowledge sharing data will be available through digital sources. Cultural opportunities for local indigenous groups. © 2019 Normanton Solar Farm. All Rights Reserved.